Originally launched in an award-winning food truck in 2011, co-founders Jackson, Khatera and Wes now run a full-scale gelato manufacturing operation based out of Atlanta, Georgia. Honeysuckle Gelato combines the rich and smooth texture of gelato with the decadent flavors and desserts of the South. Each ounce of gelato and sorbet is made from scratch in their facility using the finest and freshest ingredients. They do their best to use local products but are committed to scanning the globe for the highest quality products available. Our passion and focus on quality allows us to offer our customers exactly what we envisioned… gelato from the South that is worthy of the region’s celebrated culinary roots. 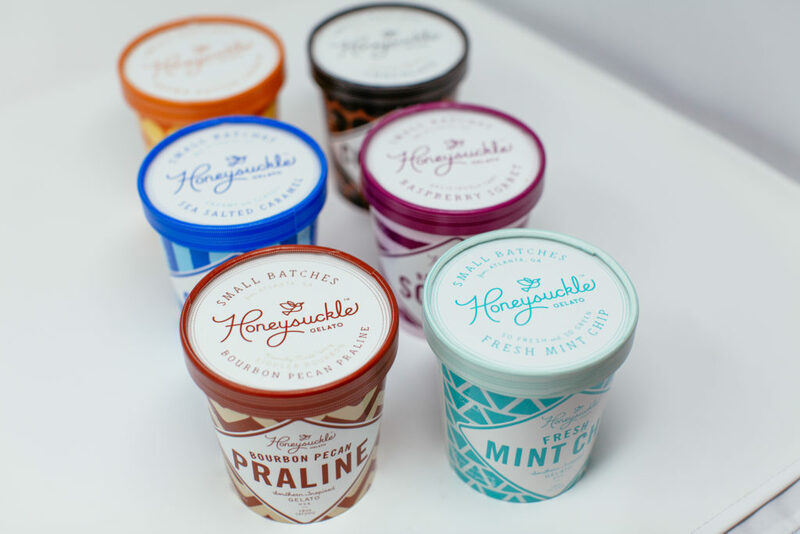 Honeysuckle Gelato’s new packaging and production facilities have them poised for significant growth. Their commitment to small batch production ensures the highest quality gelato on the market. They source their products locally whenever possible and use only natural products. Honeysuckle Gelato’s pints are found in retailers across the southeast, including Whole Foods, Earth Fare, and The Fresh Market as well as over 75 independent retailers, a number that is growing. If you are interested in carrying Honeysuckle Gelato pints in your store, please contact Jay Johnson at jay@ambactusgroup.com.